The first image is from "Pants" by Anna Romaniuk and Ellen Knight. The second is from "Professional Pattern Making for Designers of Women's Wear" by Jack Handford. Both books date ftom 1974. Both drafts create knee and hem widths of equal size on the topsides and undersides! Is there a way to correct this on the patterns without distorting the shape? The slope of the seat seam on the Handford draft appears to be created by a lengthened dart as part of the overall waist reduction. I have not seen the angle calculated this way before. I'd like to know why American drafts are always drawn with a closed leg? You see it on all the older ones. Don't know about the new. My only english draft (I have no american) is maybe from the 60 th. It is from Ann Hagar. 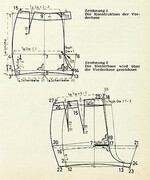 I have drawn a Müller pants (same measurements) over it. You see that are 4 cm more ease in the english at hip level and 2 cm at crotch diameter. The crotch length is the same. Interesting is the front pattern in the second draft the outseam has a different angle and so more length as the back outseam. I made a quick and shoddy attempt at neatening up some of the lines, shifted the side seams by 1 cm on front and back to enlarge the back and adjusted the grainlines to center accordingly. I also put in a slight dart along the center back seam, as an actual trial of this draft gaped at the back waist. The book does state to walk the pattern to adjust the outseam length of the back pattern to match the front, but SketchUp is a bit limited in terms of drawing curves and correcting patterns. Still, it's better than freezing over my cutting table right now! The resemblance to the draft by Jack Handford was uncanny. I can't seem to find the same photo online again, though. (Maybe I imagined it?) Good question about American drafts having closed legs. I always assumed it was down to the need to draw excessively pear-shaped hip curves for women's trousers! I remember seeing a side-by-side comparison of women's pants, one drafted using Müller and the other from Winifred Aldrich. The Aldrich one was much larger with excessive ease. I have the first edition of Metric Pattern Cutting from 1975 boxed up somewhere. I wonder how it would compare to the one by Ann Haggar? Here is a third variation on the Romaniuk/Knight draft, in which the back pattern was enlarged by about 1/2" at the hem and knee, the center back seam squared to 90 degrees, and the width at hip level on the back pattern was measured and corrected, as kindly suggested by Terri. I also dropped the front waist line a tad, based on the first trial pair sewn up. 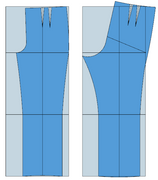 The inseam and outseam lengths have not been trued, nor have the fork seam or darts due to software limitations! I attach a müllerdraft done with your measurements. So you can compare. They have side seam construction line with 102 cm. Nicely shaped in the lower parts. I would suggest that you eliminate the first waist dart in front and move the CF at waist this amount to the outside of the pants. It will be slanted so it has more give going over the belly. Then close one of the back dart half and give your back outseam a nice hip shaping. Enlarge the 2. dart with the rest of the 1. Dart and put it into center of back waist. But you have now a wider hem. It would maybe more correct if you had reduced the front part and then enlarged the back pattern so your hem circ stays as is. The line to do this is the knee line and going down for hem. But this depends on the logic of the draft and where there the ease is. Unfortunately, I can't seem to view the Müller draft image. Here is a new drawing with the changes implemented. I altered the darts as you suggested. I also narrowed the front at the hem and knee by the same amount the back was widened to keep the original hem width. sorr,y you couldn't, forgot to add. your draft looks (theoretical) good now. if you compare them you see your (back) draft is a bit more angled out. Better more for a more round bum. But you have to sew a muslin. I have just finished the full size draft on actual paper. Hopefully in a day or so I will have the muslin sewn up. Here is a draft for suede hot pants. Definitely not trousers, but as the weather here is already heating up, I wouldn't mind something cooler! The image was from an old eBay listing for a Rundschau issue dating from around 1971. With the leg shape curving up in the middle, how is one supposed to turn up and sew a hem...? This must be something most simple and obvious, but for some reason just I cannot get my head around it. What would a suitable hem allowance be, assuming a similar cut out of cloth (rather than suede)? Obviousely the finished hem can´t be wider than 2cm, because the pants arn´t longer than 2cm at the crotch. The curve peak is just 1cm, it should be possible to do a normal hem. Depends on the fabric also. If in doubt just stretch the hem by ironing and fold it inwards to look if it works. Usually with a pattern of that type you add the hem allowance onto the pattern and for the leg openings, you allow enough to make either a single or double turn to get the edge type you require. I on and off make mens work shorts for the hot weather (we call the stubbies in OZ) and the concept is not dis-similar to the design you have in mind. You are fortunate that ladies shorts are far less problematic that guys ones.